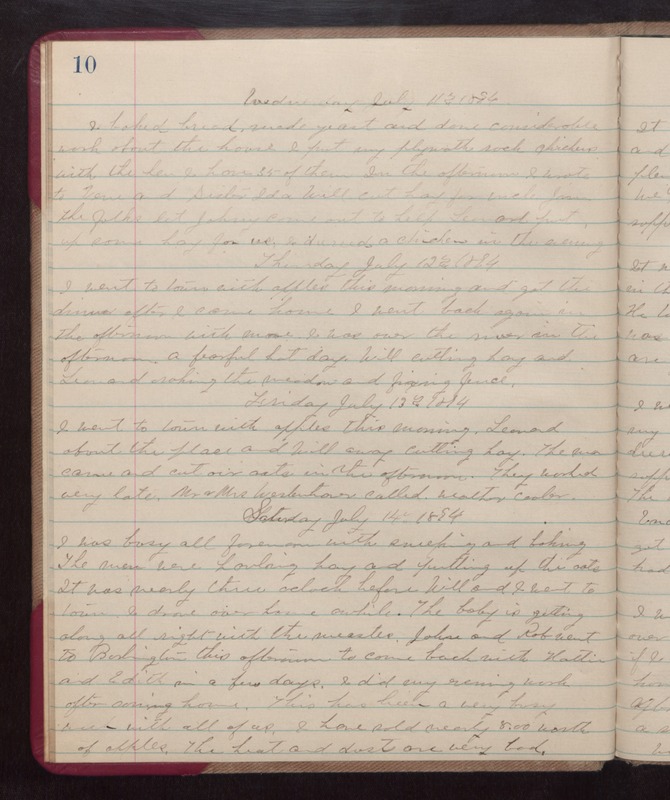 Wednesday July 11, 1894 I baked bread, made yeast, and done considerable work about the house. I put my plymouth rock chickens with the hen. I have 35 of them. In the afternoon I wrote to Vene and Sister Ida. Will cut hay for Uncle Jim. The folks let Johny come out to help Leonard put up some hay for us. I dressed a chicken in the evening. Thursday July 12th 1894 I went to town with apples this morning and got the dinner after I come home. I went back again in the afternoon. A fearful hot day. Will cutting hay and Leonard raking the meadow and fixing fence. Friday July 13th 1894 I went to town with apples this morning. Leonard about the place and Will away cutting hay. The man came and cut our oats in the afternoon. They worked very late. Mr & Mrs Westentower called. weather cooler. Saturday July 14th 1894 I was busy all forenoon with sweeping and baking. The men were hauling hay and putting up the oats It was nearly three oclock before Will and I went to town. I drove over home awhile. The baby is getting along all right with the measles. John and Rob went to Burlington this afternoon to come back with Hattie and Edith in a few days. I did my evening work after coming home. This has been a very busy week with all of us. I have sold nearly 8.00 worth of apples. The heat and dust are very bad.